An upcoming trip can be both exciting and exhausting. But searching for great accommodations shouldn’t be a roadblock to getting on the road. Feeling pressed for time in a world that rewards the busy, one might feel that dashing off quick one-line notes to query about a few listings would be enough to get responses rolling back in. It’s a common mistake, but one that you don’t need to make. Take a few minutes to register with us. 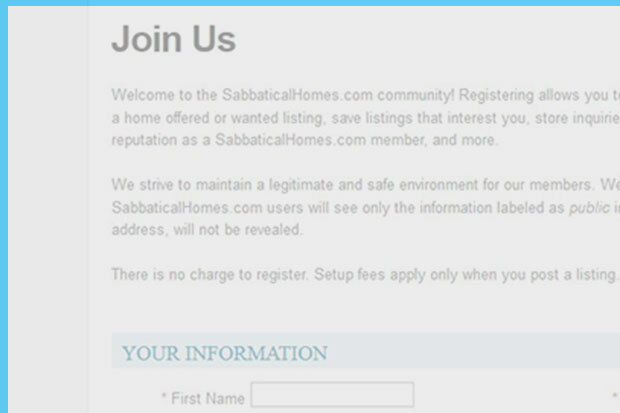 Not only is registering free, it allows you to set up a profile that includes information about you and what you’re looking for. Although messages from unregistered guests are submitted, if they lack detail, they might be blocked or ignored by listers. Messages from member to member have more credibility–as many people prefer to work with other members connected to the site. When you send a query to a potential match, include information about yourself, what you’re studying, and how long you’re looking for accommodations. One-line emails that merely inquire about dates or prices and offer no personal information at all are unlikely to get a positive response. One of our new members recently shared his registration experience. In a bit of a time crunch, as his trip was just approved, he skipped our registration process. Unfortunately, the dozens of one-line queries he sent out to our members were blocked. This is the perfect example of why taking the time to present a query as a registered member makes a difference. With a bit more information, potential connections feel confident in moving forward. Not all matches are made in just days as this one was, but often all it takes to start the process is a well-written query.